NMAT By GMAC 2018: NMAT Exam Dates is scheduled to be held from October 07, 2018 to December 20, 2018 by Graduate Management Admission Council (GMAC). NMAT by GMAC Registration has been started from today July 04, 2018. Students who are interested as well as eligible can apply for NMAT by GMAC exam till October 03, 2018 by submitting their NMAT Application form along with all relevant documents /certificates on or before the last date reach. NMAT by GMAC 2018 Details!! NMIMS Management Aptitude Test is a computer based national level entrance test which will be held in 75 days test window to offer admission to eligible students in top MBA colleges like NMIMS Mumbai, XIM Bhubaneswar and many other Universities & B-schools. Students, if you want to grab furthermore details about NMAT by GMAC 2018-19 must go through this web page which is well created by the expert team member of www.privatejobshub.in. How I Can Fill NMAT by GMAC Application Form 2018? First and foremost step of each individual is to open official website of NMIMS Management Aptitude Test that is www.nmat.org.in. Now press on “Register Now Open” that is available at the right side in the quick links. New users are required to hit on “Register” tab as shown in below image. After pressing on register tab image as shown below will appear. 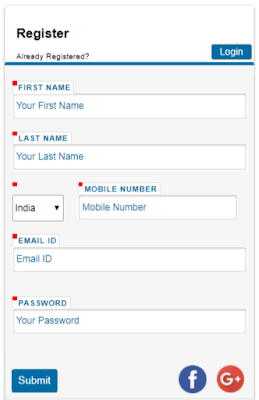 Now new users are required to enter the details like their name, country, mobile number, email id and a password. When the details are filled hit on submit tab. Then, new windows will pop-up asking them to complete the application form. Further candidates will get an authentication email on the registered email address; they will have to validate their email id. After verifying the email, they can press on “Login” and enter their email id and password to get access to their NMAT by GMAC 2018 account. Those who are already registered are required fill the asked details. When all the details are filled then you need to press on “Login” tab. After logging into the account, candidates will have to complete all the sections that are they have to mention their personal information, contact information, education and work experience, programme/school preference and additional information. Further applicants can choose up to five programmes/ schools under the “School Preference” section. Beyond five programmes/ schools, they will have to pay Rs.200 + applicable tax for each school/ programme. After that candidates will have to upload a recent photograph. Uploaded photo will be printed on the NMAT by GMAC admit card. Before submitting NMAT 2018 application form candidates must review the details. After submitting the form, they cannot make any changes in the form apart from ‘School Preference’ section and ‘Communication Preference’ section. Once the form is submitted, the next screen will display the registration number for NMAT by GMAC 2018 exam. Contenders are required to pay a non-refundable fee of Rs.1800 plus applicable taxes. 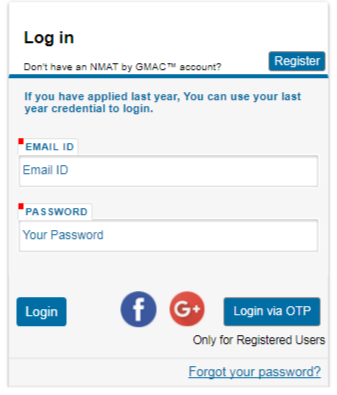 After making the payment, candidates will receive unique NMAT by GMAC Registration ID through email. Upon logging in to the official website through the credentials, candidates will be able to schedule and download the NMAT by GMAC admit card 2018. The hard copy of admit card will not be sent to the applicants. You may go through above given Official Link to acquire further details in regard to NMAT by GMAC 2018 Apply Online. You can also bookmark our web page using ctrl + d key to gain upcoming details and recent facts on NMAT by GMAC 2018.